Odisha - In a move to promote odia food , people of Odisha decided to celebrate march 20 as Pakhala Divas.Everyone decided to eat Pakhala on 20th march to welcome this summer with odishas traditional food.It is expected a big celebration from this year onwards along with Utkala divas. Pakhala-Pakhala is an odia term for an Indian food consisting of cooked rice washed or little fermented in water. The liquid part is known as Torani. It is popular in odisha, Bengal, Assam, Jharkhand and Chhattisgarh. The Bengali name for this dish is Panta Bhat. Eating pakhal has been recommended to prevent heat stroke in hot weather. A traditional Odia dish, it is also prepared with rice, curd, cucumber, Cumin seeds, fried onions and mint leaves. It is popularly served with roasted vegetables as potato, brinjal, Badi &saga bhaja or fried fish. History-It is unknown when Pakhala was first included in the daily diet of Eastern India, but it was included in the recipe of Lord Jagannath Temple of Puri. The Jagannath Temple was built in the tenth Century AD, so Pakhal was in existence at that time. 1) Jeera Pakha?a is made by adding fried cumin with curry leaves with Pakha?a. This is made by adding Curd with pakhala. This is generally made by adding water instantly after making rice or with warm rice. This is made by fermenting rice by adding water which is generally kept overnight and eaten in the next day. 1.Cook rice and allow it to cool (do not freeze). 2.Fry some cumin seed and grind it to fine powder. 3.Add curd and fried cumin seed powder, coriander leaves and salt to taste. 4.Traditional way of preparing Pakha?a Pakha?a is slightly fermented rice. people cook rice and add water to it along with little bit of old pakhal (something like making curd using milk and old curd). Pakhala tastes best when served after 8 to 12 hrs after preparation. Generally boiled potato and other fried vegetables or fried fish is served with pakhala. Modern day variation is to add curd instead of fermenting it. Why March 20 - The March equinox will occur on March 20, 2019. This marks the beginning of spring in the northern hemisphere and fall (autumn) in the southern hemisphere from an astronomical viewpoint.Twice a year, around March 20 or 21 and September 22 or 23, the sun shines directly on the equator and the length of day and night are nearly equal in all parts of the world. 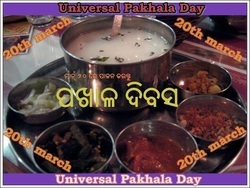 So 20th March is the perfect day to celebrate Universal Pakhala Day. group of Odias to promote our food, be a part of it, spread the message! !